A CGI from architects Chassay & Last. “Affordable” housing entrance not shown. 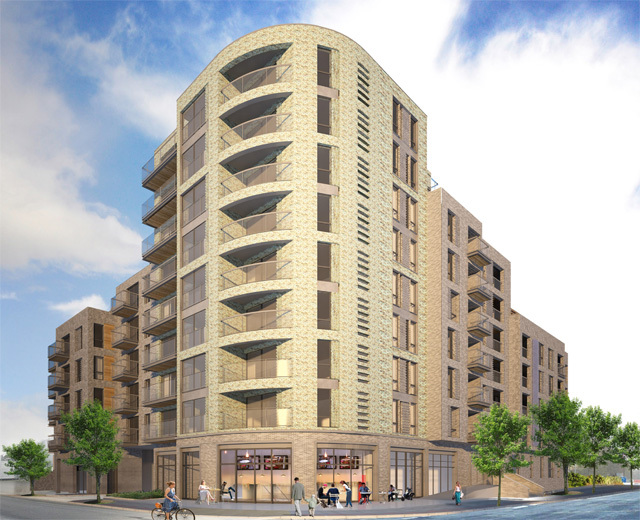 Greenwich councillors deferred a decision on controversial plans for a nine-storey block of flats on Woolwich Road at a meeting last night. The Charlton Champion wasn’t at the meeting, but understands from those that were there that the decision to defer a decision was made because of plans to include “poor doors” – a separate entrance for residents living in the block’s “affordable” housing elements. The block, at the junction of Gallions Road, is due to replace Valley House, a former council building and headquarters of Sykes Pumps, and sits opposite the Sainsbury’s/M&S development. Just 18.9% of the accommodation was slated to be affordable, with all other residents able to use the building’s main entrance. Three local groups – the Charlton Society, the Charlton Central Residents Association and the Greenwich Conservation Group – had objected to the building’s height. From The Murky Depths puts the case for building high on the Woolwich Road here, as well as discussing a plan for more car parking on Bugsbys Way that was thrown out by councillors last week. findings of the report’ – do you, or anyone, know if that viabilty report has been made public? After the recent Dragon Knight issues on the peninsula – where the confidential viability report was shown to be cobblers – I’d be shocked if another scheme with such low levels of affordable housing was passed without publishing the report. I know the council are proposing to publish all future viability assessments, is this one included I wonder. AFAIK the viablity report has not been made public. Poor doors? Really? Can hardly believe it! I’m shocked. Anyway, what is “affordable”? To buy or to rent? Can’t we just go back to having proper council flats/houses again? It seems strange to use poor doors in Charlton as they tend to be reserved for glitzier developments where there is perhaps an argument that the affordable homes residents would not want to pay the service charge attributable to a concierge service and crystal chandeliers in the foyer. It does however mean that the affordable homes tend to get a drab entrance round the back by the bins – not sure this needs to happen in Charlton, I don’t think it is the case on GMV? Personally I think the development is probably 3 floors too high (and the rest of the Sainsbury/M&S development too low by about the same amount) but it is the low level of affordable housing that annoys me. The affordable housing targets are known quantities so must have been factored into budgeting assumptions when site viability assumptions were carried out prior to the developer buying the site. Seems to me they are either pulling a fast one or are not terribly good at doing their own job. On the question about the definition of affordable, I think as little as a 20% discount to full market rent qualifies. Spoontaneous – Yup, it’s for real. What happened to squatting? I remember when everyone did it. I’m surprised it’s not happening more, given the levels of rent charged.